The latter portion of August is historically a dumping ground for all of the movies Hollywood wanted to release in the summer but did not consider to be potential blockbusters. 2012 is a bit different in this regard because two strong openers debuted last weekend and now four new titles are ready to enter the marketplace. Each is well positioned to target a specific demographic. As many as seven titles could earn north of $10 million this weekend, a feat that has occurred on only one other August weekend in box office history. The upcoming weekend should bring a lot of joy to Hollywood. The 800-pound gorilla this weekend comes in the form of Sylvester Stallone. And Arnold Schwarzenegger. And Bruce Willis. And Dolph Lundgren. And…okay, the 8,000 pound gorilla this weekend comes in the form of The Expendables 2. The quick follow-up to the 2010 release is going to win this weekend in a walk. The first movie opened to $34.8 million on its way to $103.1 million in final box office. At a minimum, the sequel will do better on opening weekend. What we learned in 2010 is that the Ocean’s 11 concept of casting a lot of established names in the same project blends perfectly with a bunch of semi-retired action heroes from the 1980s. Stallone and Schwarzenegger alone had carried more movies in that time frame than most actors manage in their entire careers. Stallone was the lead in ten actions films, assuming that Over the Top qualifies in this regard. Even if it doesn’t, I didn’t include the vastly superior Victory, so he made at least one a year during this time frame. 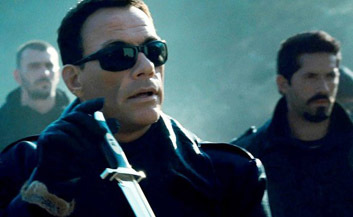 Schwarzenegger filmed nine action titles in the same time frame; yes, the 1980s included one shoot-em-up flick each from Stallone and Schwarzenegger on an annual basis.